I have a pupil who has a sphere and I need to create a hole at 45 degrees can you help? To create a plane at 45 degrees from the initial working planes, you can select two starting planes (i.e. Top & Right), then select the plane command. If you selected the planes before the command it should automatically set itself to "midplane". There is a checkbox to change which direction the plane is going. You can then use this new plane however you want. You may need to offset it outside the sphere to drill a hole into the sphere at a required depth. 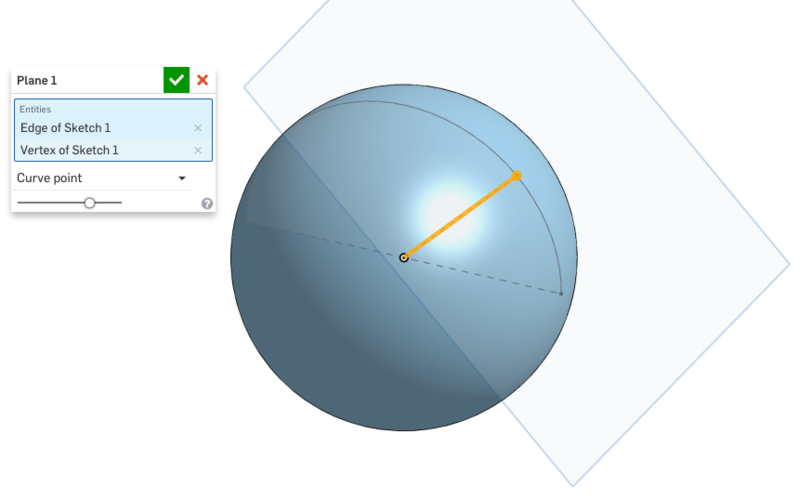 You could also add an angled line to your semi-sphere sketch that you used to create the sphere and then create a plane normal to that curve endpoint. Then create a sketch on this new plane (if using the hole tool, just create a point coincident with the end of the line).